Thanks to the more than 300 REALTORS® who joined us for the 2012 Midyear Market Update on the morning of August 15. 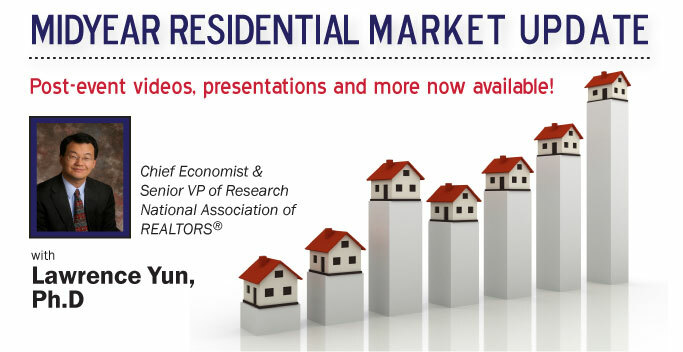 Dr. Lawrence Yun, chief economist and senior vice president of research for the National Association of REALTORS® delivered the keynote address and had plenty of good things to say about the Charleston market. Find more follow-up materials, videos, photos and presentation downloads below. If you attended, please complete this short survey. As a REALTOR® member benefit, please use and share the following materials as you wish–they make great blog, facebook, twitter and website content. Presentation Download | Download Dr. Yun’s presentation, here. Videos | Access a full playlist of video highlights from the update, here. Infographic | Download a PDF of the Midyear Market Update Infographic, here. Photos | View an album of photos, here.